This collection of sixty-one new poems, the most ever in a single volume of Oliver’s work, includes an entirely new direction in the poet’s work: a cycle of eleven linked love poems—a dazzling achievement. As in all of Mary Oliver’s work, the pages overflow with her keen observation of the natural world and her gratitude for its gifts, for the many people she has loved in her seventy years, as well as for her disobedient dog, Percy. But here, too, the poet’s attention turns with ferocity to the degradation of the Earth and the denigration of the peoples of the world by those who love power. 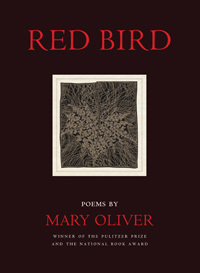 Red Bird is unquestionably Mary Oliver’s most wide-ranging volume to date.